Leon Guerrero, the Pinoy "Lone Ranger" symbolizes the fight of good over evil and the triumph of right over wrong. The name was always associated with actor Lito Lapid. But did you know that before Lito assumed the role of Leon Guerrero, it was his uncle, Jess Lapid Sr. who introduced this legendary gunslinger to the local movie scene. The movie, Leon Guerrero: Laban sa 7 Kilabot was released in 1968 a few months before he was gunned down in a QC nightclub. In 1982, 14 years after, the young Lito Lapid came up with Alamat ni Leon Guerrero. Sir, Lito Lapid starred in two Leon Guerrero movies. The first remake titled "Ang Pagbabalik Ni Leon Guerrero" was shown in the late '70s. Leon's costume was black. 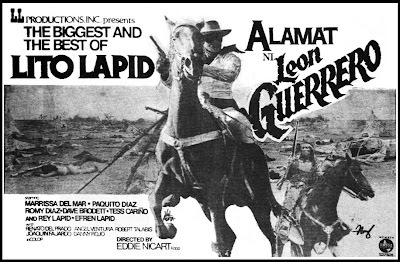 "Alamat Ni Leon Guerrero" was sort of a Filipino version of Hollywood's 1981 hit "The Legend Of The Lone Ranger". Leon wore the white Lone Ranger suit this time. Anyway Sir. Yours is one of the best blogs I've visited. Thanks for sharing all of this. Far out. sir, thanks of posting some of lito lapid's old movie pictures. hope that you post other of his old movies, like isla santo nino, anak ng tulisan..thanks. hi! i was looking for the details of this movie's ost...do you have any idea which recording label owns the rights to the songs used in the film? thanks! Can Lito Lapid's old movies released DVD or VCD copies? can this be remake for the big screen or in teleseryes? particularly in abs cbn, since he was gonna have it a teleserye sooner in title "the little champ"
JULY 13, 1968: "JESS LAPID SLAIN IN QC"